One of the most popular features of the MyGame online mentoring system that poker staking company Badbeat.com launched earlier this summer is its “Play & Fix” feature that gives players feedback on their actual game play. 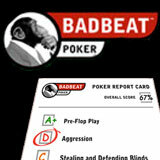 “Play & Fix” Report Cards are just part of the comprehensive online poker training system that Badbeat developed for their stable of sponsored poker players. Now the MyGame poker training facility is available free to anyone that’s serious about improving their game. The new system is designed for any player that wants to learn, win and transform the way they play poker - all for free. It builds player’s poker skills from the ground up by analysing actual play, spotting weaknesses and showing how to fix them. Access to Badbeat’s tutorials, the unique hands analysis tool, Report Cards, and Social gaming features are all free after registering with any of Badbeat’s partner poker sites. Currently the system can monitor their play at all of the major Poker sites including Party Poker, Betfair Poker, PokerStars, Mansion Poker, Poker Encore, Royal Vegas Poker, Red Hot Poker, Poker Time, TGF Poker & Betsafe. MyGame training tools are completely free. In addition to this Badbeat offers Sponsorship packages to good or promising players. As well as being fully bankrolled, sponsored players receive cutting-edge software tools and a structured development path with advanced learning aides, coupled with the knowledge, expertise and 1:1 support from a pool of world class poker mentors and support staff.